I love that the past two days in my classroom have been filled with students coming in and perusing the bookshelves more intently than they usually do. Why? Because we're only a few days away from a two week holiday break, and they want to make sure they have books to carry them through those weeks. Student - "Why do you need so many books?" Another student --- "Our break is two weeks!" Student - "It is? I better get a couple more." Student - "Mrs. Heise, can you recommend some books for me for over break?" Me --- "Of course, what kind of books do you want?" Student - "Something like The Distance Between Us. I want a Kasie book." Another student - "Oooh, I loved that book! Wait, what are you recommending?" Student - "Mrs. Heise, Do you have any new books?" Me --- "Yes, I do. I have these and I just got some last night." Student - "Yes! I call dibs." Student - "Hey, have you read xyz?" Another student - "No. Not yet." Student - "You need to read it now. Add it to your stack." Student - "Mrs. Heise, how many books can I check out?" Me --- "As many as you want." These kinds of conversations are secretly thrilling to me because I can see that my students are becoming readers. They're becoming the kinds of readers who want to make sure they have books available for when they know they're going to have free time. They're making plans for reading. They're excited about books and authors and reading. I've seen more, bigger bookstacks than I ever have heading out of my classroom before. This is what I love to see. Tomorrow we'll be "officially" setting goals for our reading over the holiday break and making sure everyone has enough books to get them through, but I especially love that this year students have started initiating this on their own. 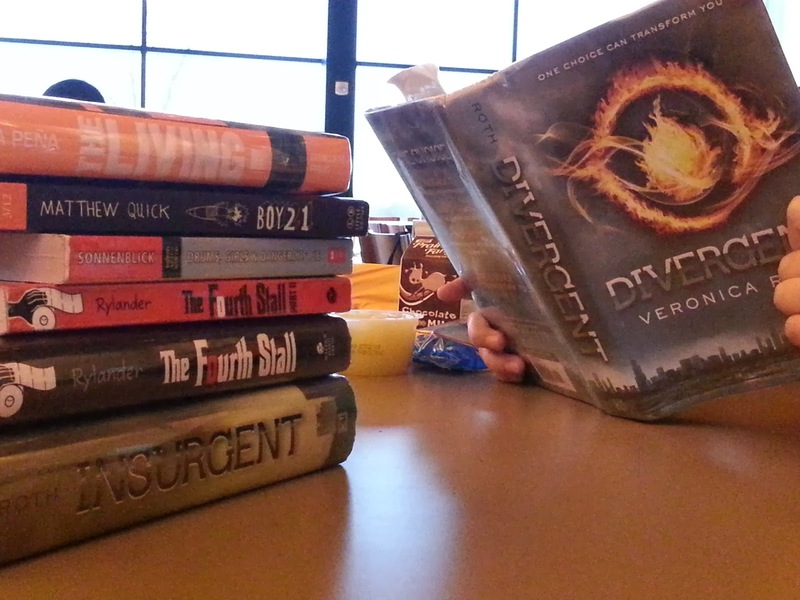 One of my 7th graders took out his break reading bookstack to show off during after-school study hall. 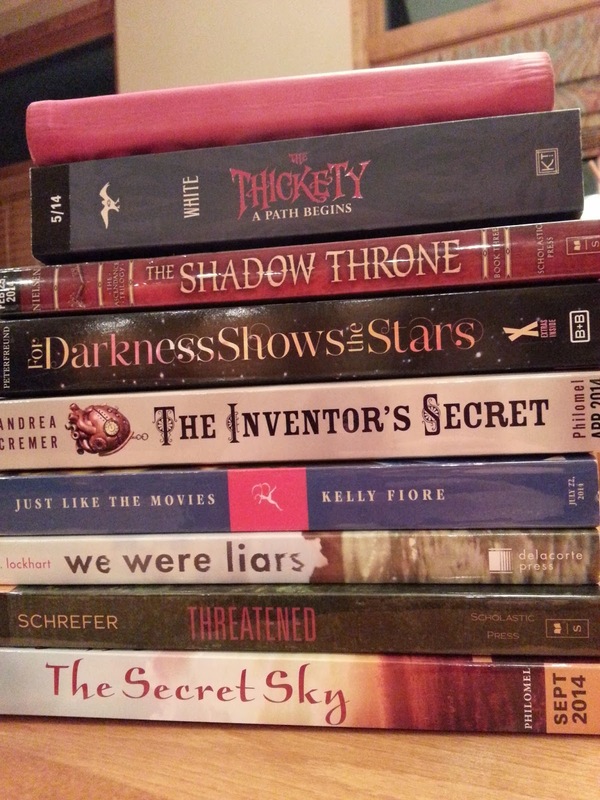 My break reading bookstack - and, yes, there are many more titles on that Nook. A sign one of my 8th graders made me after school today. Just had to add it because it makes me smile. I love this. 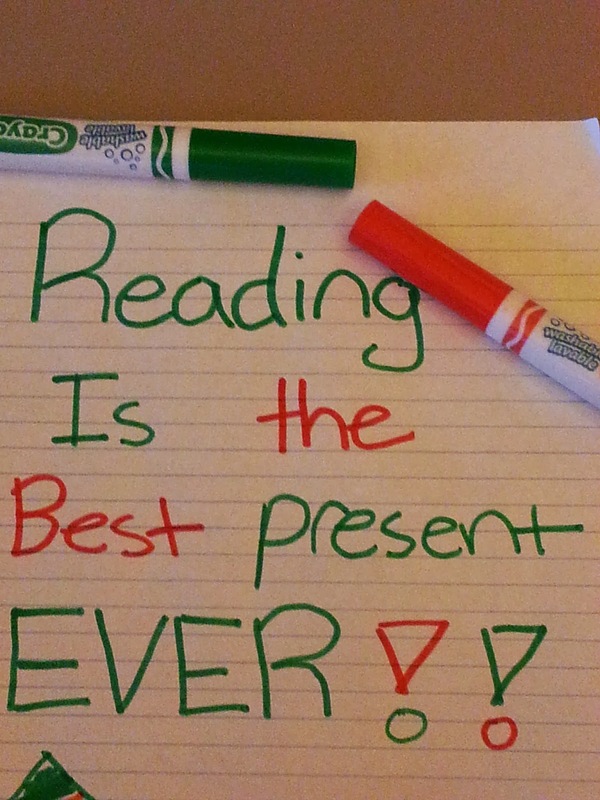 You've done a great job instilling the love of reading. Definitely the best present ever! I nominated you for a Sunshine Award! Participate if you care to!